Isn't this gorgeous? This is the cushion I received from Lucy for the exchange on Exchange Heaven. I love it, she has used colours I like and it is a wonderful addition to my front room. It is beautiful. A lovely piece! What a gorgeous piece of work. beautiful cushion Jane. Hope you have not caught the french knot bug, it can be addictive!! That is so pretty. Perfect for you! Wow, that is gorgeous! A lot of stitches in that house! I LOVE this design. 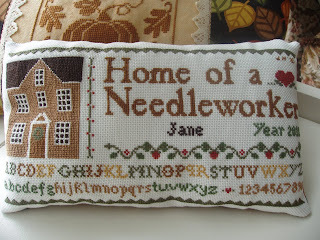 I made it into a large pincushion for the workroom and it makes me smile every time I see it. Lucy has done a wonderful job of it. Gorgeous. What a beautiful gift. It's lovely. Oh, that's wonderful! It's the perfect announcement to your home. Oh wow, that is a stunning piece of work - and it was for an EXCHANGE?? That would take me about a year to do - no way would I part with it!! Talking of exchanges, I mailed my card out to you today. It will be a surprise - it's not on my blog - lol! Hope you like it.